One of the constant challenges we have as e-learning developers is to transform passive text content into something that’s fun and engaging for the learner. It is our mission to find ways to add various types of multimedia that invite learners to interact with the content and maintain a certain level of control over their learning experience. As with most things, doing this is a balancing act: interactions that simply add a few clicks to your course do not add any value! The key is to craft meaningful activities that bring learning value and have a clearly articulated instructional purpose. Let me show you an example that I’m sure you’ve encountered before: a big long slide filled with text bullets. As I mentioned, you should always be able to clearly articulate why an interaction is worthwhile. In this case, I’ll take you through how we improved the content by turning it into a hover-and-reveal interaction. Presenting large paragraphs of text all at once will likely overwhelm the learner. By creating this interaction, we broke the content into smaller, more digestible chunks, and presented each one individually. Both actions make it easier for the learner to focus on just the information being presented at the time. Before, we had too much content to show all at once, so we had to deliver it over multiple slides. By turning this into a hover-and-reveal interaction, the content is delivered in bite-size chunks that fit on one slide. Streamlined content helps learners see right away what’s important, without having to dig into the info to decode it. In the first example, the text dumped all the info on the learner at the same time. They really had no control over the order or amount of content coming at them. With the hover-and-reveal interaction, learners can interact with the screen to reveal the information at their own pace and in their preferred order. This gives learners more control of the learning experience. This is just one of the many ways you can transform a static interaction into dynamic, engaging content. 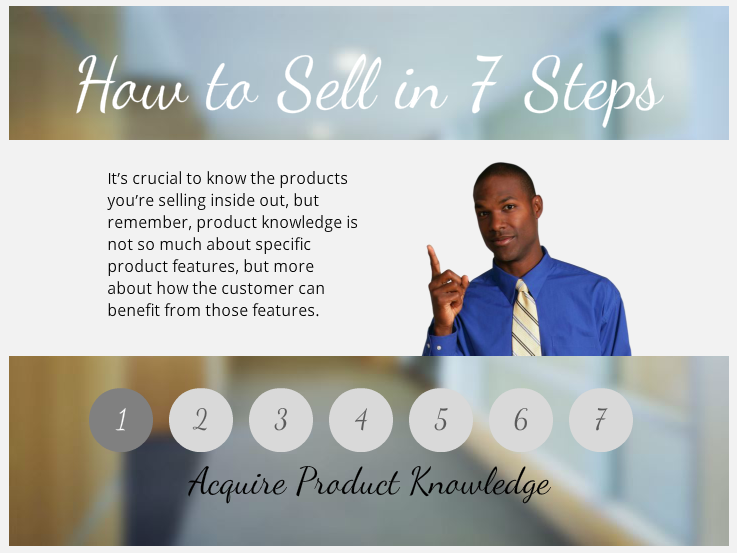 If you enjoyed this interaction, you can download the free template for Storyline 2 right here. Stay tuned over the next few weeks because I will convert this same interaction into a click-and-reveal and a drag-and-drop to show how varied the possibilities are for even one single piece of content. Do you have any ideas on presenting this type of content? If so, let me know in the comments! Sleek, elegant, easy to navigate and engaging. The total package of training awesomeness. Thank you for the lesson and for providing a fresh perspective of using the mouse over state to move through the content instead of a more predictable tab interaction. Can't wait for your next example! That looks great, Nicole - thanks for sharing. Transforming "static content" is something we're in the slow-but-sure process of doing with our existing training. This is amazing and really transforms the "feel" of the information. Thank you for sharing. I love the design, Nicole! I'm going to keep this in mind for future use! Agreed, love the enhanced look and increased interactivity. Nicely done. Would anyone consider adding a "viewed" state to the buttons so the learner can track their progress and see which they've viewed? Not only can you add a trigger to change the state of each object to Viewed, but also add a trigger to hide a Next button until each object has been viewed. Your users can control the order, but can't continue until they've seen everything. Excellent example! Very clean with great transitions. Great transformation from text filled to interactivity - love the idea! As Rachel above, would love a template. Good work and so slick. When using the Show Layer option to display information, and using the "Mouse hovered over" option, the user doesn't know when this takes effect to display the layer and hide it again. I sometimes remove the "restore on mouse leave" check box so the information stays on the screen on mouse over and doesn't leave until the user moves the mouse to a new hot spot. This way there are less surprises by people with less computer skills than ourselves. Just experiment and then get feedback from your users. I only wish I had a designer I could call on as that is not my strength. Hi Ross, I used States for my example instead of Layers. I read somewhere that Layers use more memory when compiled and sent out. Hi Zachary, I find that the use of layers can also enable animation as layers also have timelines but states do not. Can you do much with States as I use them to indicate that a user has visited somewhere by changing the state of a button etc. I think it is about learning more from each other and trying things out to enthuse our uses. Love it! Would also appreciate a template! Thanks. Thanks, Nicole! I have a question for the community. I did the same thing a month ago, but I used the "Selected" event in States instead of Hover. Does this community think users prefer a click to display the content or a hover? It might also depend on the device. If you're not using a mouse (like on a tablet), the user may not be able to invoke the hover state in a meaningful way. Interesting way to display content. Thanks for sharing! 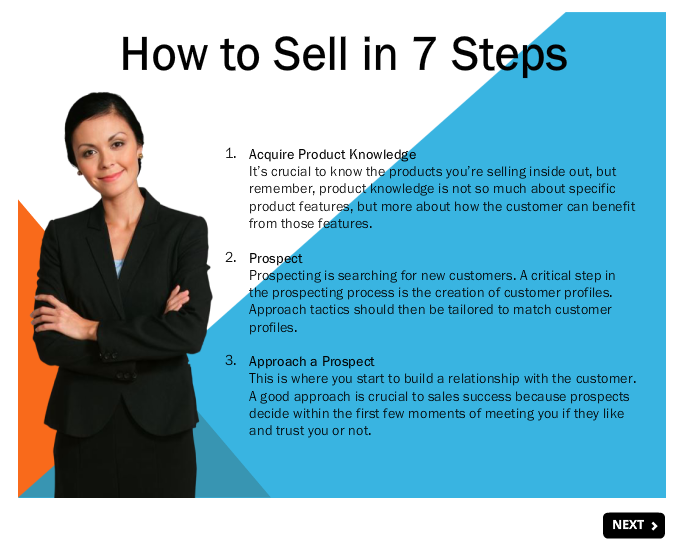 BTW, I thought you would want to know that "Prospect" is misspelled under Step 2. Thanks Susan - when I reviewed more closely, I spotted a few spelling errors! Argh! This is why one cannot review their own work haha. WOW - Brilliant work. Thanks for sharing! I as well would love to know how to get all of that created. This is brilliant, thanks for sharing the template Nicole! nicole, I'm sorry but it is not a big deal. kindergarden style instructional design cannot be brilliant design. Interesting point. As you clearly know about "brilliant design", please share how you would present the same content. I'm sure we would all be appreciative of you sharing your expertise. Hi Saldiray, I think that's a little unfair. Not everyone is at an advanced stage in their design career or in their technical skills - there are people commenting in this thread that they are new to this - and sometimes the simple ideas can be highly effective. This design uses some key ID principles that help with learning and engagement and just because it could be more complex doesn't mean it needs to be. Brilliant design is design that meets it's purpose, and if this meets your purpose (and your skill level) then it's brilliant. I concur Helen. I think you missed the entire point of the exercise, Saldiray. It was, to reiterate the title of the lesson, how (she) transformed this static content (using the hover effect). Please remember, it was a lesson on how you can do just that. 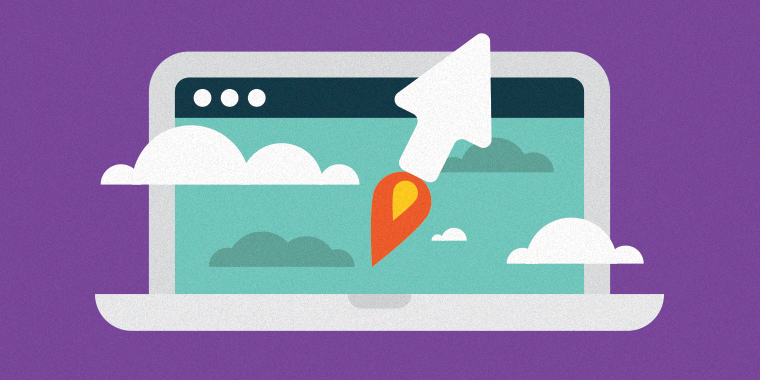 It displayed a fresh perspective on a common task that most people who create elearning often face. As just an average member of this community I have come to know and love, please keep in mind that some of us in this forum are new to Storyline 2 and need help unlocking the true potential of the tool. Other more seasoned members, may sometimes overthink our design, adding more than is necessary to get our topic across (when less is more). This served both purposes and with a nice design and flow. This was, as a lesson, and in the way many lessons and tutorials on this site are designed, not a cookie cutter answer to every elearning question. What they are, to me and others, are opportunities to demonstrate how you can use the many features of this authoring tool in different ways. I am so glad that this forum, to date, has been non-judgmental and nurturing. It allows both novices and the seasoned to coexist, share talents, ideas and perspectives using all of what Articulate has to offer with others in their field. This has always been without fear of being belittled because we are not all operating from or catering to those on the same level as ourselves. I hope that spirit continues to flourish. Great job - I love the clean look and look forward to seeing the click and reveal and drag and drop options. Great job - simple and elegant. The design gets the material across in a very effective manner. This is fantastic, i will forward these examples to other people on the project team to help them understand the usefulness of chunking information and introducing interactivity.